On October 23rd, Truman State University’s chapter of Delta Sigma Pi received top honors nationally by being selected as the Most Outstanding Chapter in the nation. National officers presented the award to Matt Vennemen, the President of the Iota Nu chapter of Delta Sigma Pi at the LEAD (Leadership and Excellence Academy for Deltasigs) School in Indianapolis, Indiana. The National Most Outstanding Chapter award is given to the chapter that best exemplifies the purpose of Delta Sigma Pi. The chapters are evaluated on professional activity, community service, fundraising, academics, and others. In addition to the National Most Outstanding Chapter Award, the chapter also won the national award for Most Outstanding Professional Activities, the Provincial award for Most Outstanding Chapter and Professional Activities and Outstanding Scholastic Development for the Gateway Region. The Iota Nu Chapter of Delta Sigma Pi continuously strives to improve its programs in order to represent Truman State University effectively and hopes to earn national recognition in future years. The Iota Nu (Truman) Chapter of Delta Sigma Pi was founded December 9th, 1978. Since then it has claimed the National Most Outstanding Award nine times, which is more than any other chapter. The International Fraternity of Delta Sigma Pi was founded at New York University, School of Commerce, Accounts and Finance on November 7, 1907. 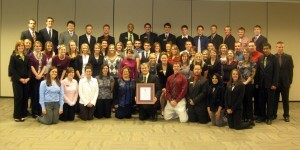 Delta Sigma Pi, a Professional Fraternity, is one of Truman’s organizations open only to students majoring in Business, Accounting, or Economics. They are involved in a number of activities across campus, including co-sponsoring the Career Expo, managing the University’s concessions business that provides food service at all athletic events, providing speakers to students to encourage professional development, tutoring for the Junior Achievement program which teaches basic economic concepts to young students in Kirksville’s elementary classes, and participating in Relay for Life, to name a few.